(Botrytis galanthina) Snowdrop grey mould is a fungal disease of snowdrops, which causes the flowers, leaves and flower stems to collapse and die. What is snowdrop grey mould? Snowdrop grey mould is more prominent during cool, humid or wet weather when a fuzzy grey mould appears on all affected plant parts. It is also more of a problem during or just after mild winters. Infection can start as soon as the foliage appears above ground level. The infection can also spread to the bulbs, which then rot away. You may be able to see small, black, seed-like structures (called sclerotia) on the bulb surface, or at the base of the flower stems, leaves or roots. What is snowdrop grey mould caused by? Snowdrop grey mould is caused by the fungus Botrytis galanthina, which is closely related to Botrytis cinerea that causes grey mould on other plants. 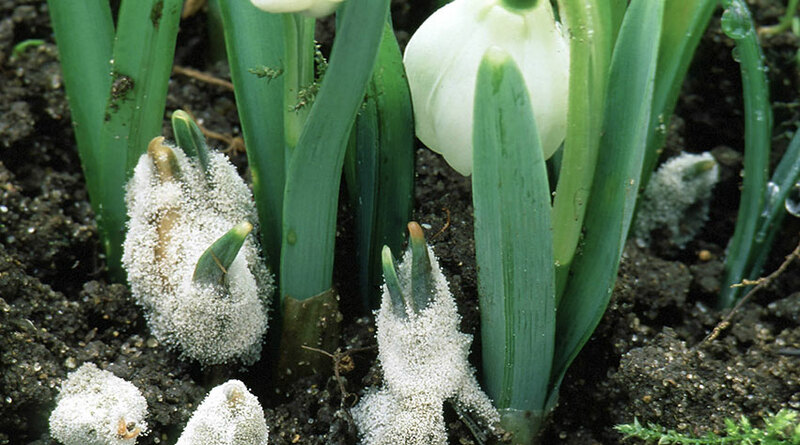 Botrytis galanthina only attacks snowdrops. It produces small, black resting structures (sclerotia), which fall to the ground in affected plant material. These can remain dormant in the soil and keep the disease going from year to year. The sclerotia germinate to release masses of airborne spores, which then spread to the leaves, stems and flowers. More airborne spores are also produced by the fuzzy grey growth, spreading the disease even further. New sclerotia are produced to infect snowdrops the following year. It is difficult to control snowdrop grey mould once it is established. So check plants regularly, as soon as the leaves emerge, especially during wet or damp weather. Removed affected plants and destroy them as soon as symptoms are seen to help prevent the disease spreading. Especially clear away all affected parts that fall to the ground. And clear away all dead plant growth as and when it appears, and especially when plants die down. Removed affected bulbs and destroy them. Don’t grow snowdrops in the same soil for at least three to five years. Snowdrop grey mould is usually worse on overcrowded plants, which prevents good air movement. SO don’t plant too closely and lift and divide overcrowded plant after flowering. Unfortunately, there are no fungicides available for home gardeners to use to control snowdrop grey mould. Check bulbs carefully, both when buying new bulbs and replanting old ones, for signs of the small black sclerotia. Also check for any signs of decay. Dispose of any bulbs showing these symptoms.